You and your best road and trail running buddies. Form a team of 3 or 5 people—any mix of age, gender, and ability, as long as your team can average a 12-minute pace or faster. Load up your team van with food, drinks, extra layers, tunes, and a fun competitive spirit. Saturday, February 29, 2020. Wave starts based on teams’ projected average pace. Team captains are asked to attend the Friday evening packet pickup: 4-6pm, Barhop Brewing & Pizza in Port Angeles. The Olympic Peninsula in Washington state. Frosty Moss HQ is based in Port Angeles, where the mountains greet the sea. The course follows the Olympic Discovery Trail AND the Adventure Route. Finally, you don’t have to choose between your roadie and trail friends. Join forces and crush the competition on pavement and dirt! 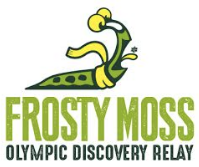 Frosty Moss Relay runners trace the Olympic Discovery Trail (paved multiuse path) and Adventure Route (singletrack trail) from west to east, beginning at the Camp Creek Trailhead along the Sol Duc River and finishing in Blyn at the Jamestown S’Klallam Tribe facilities. Teams are welcome to divide the legs among runners as they like, but a runner may not run back-to-back legs. Swag bag of Frosty Moss Relay goodies and other surprises. Comprehensive event guide and on-course race support. After-party at Club 7 in the Jametown S’Klallam Tribe’s 7 Cedars Casino, with meal, beverages, music, and awards. Bragging rights for getting after it all day on the Olympic Peninsula in February. Relay teams provide their own vehicle and should be self-sufficient with food and water. Aid stations and sanicans will be stationed at a few points along the course, but teams should not rely on them as their sole source of support. All roads will be open—traffic rules apply. Runners must stop and wait for traffic before crossing intersections. This is a challenging event! Teams must average an overall 12-minute mile pace or faster, including time spent at exchange points. That said, 12-minute teams may very well find themselves missing the cutoff. Grab a fast friend as your ringer. For everyone’s safety, teams reaching the exchange zone at Railroad Bridge Park (end of leg 12) after 8:00pm will receive a “Go Directly to the Finish Line Party” pass (aka DNF). Organizers at their discretion may also pull teams off the course sooner or direct teams to skip a leg(s) to make the cutoff. The 2020 event is limited to a total of 50 teams. Registration closes February 27, 2020. 3-person team: $TBD until December 31, 2019; $TBD January 1 to February 27, 2020. 5-person team: $TBD until December 31, 2019; $TBD January 1 to February 27, 2020. NOTE: At registration, only the team captain’s info is required. You’ll submit a team roster with everyone’s info at packet pickup. Registration ends at midnight PST 2/27/20. No on-site registration. Team captains should plan to attend the Friday evening packet pickup, 4–6pm at Barhop Brewing & Pizza in Port Angeles. Bring printed copies of your team roster and signed waivers for all teammates (linked at top of this website). There will be on-site check-in on Saturday, but be aware that the drive from Port Angeles to the start line takes about an hour. Stay in the area the night before if at all possible. PRO TIP: Register early to hold your spot! You will be running in the dark in the morning and evening. Runners must wear reflective vests, headlamps, and blinky lights when the light dims and at all times along roadways. Some parts of the course can also be dark due to the dense forest. Bonus dark: The unlit restored train tunnel on Leg 3. Weather on the peninsula can change by the minute and the microclimate. Be prepared for sun, rain, flurries, drizzle, rainbows, mist, clouds, and, of course, frost. April temperatures range from the low 40s to mid 50s depending on terrain, elevation, and microclimate. Be prepared with appropriate layers, plus warm blankets and beverages in your team vehicle. Typically, weather is wetter on the west end and gets warmer and drier as you move east into the rain shadow. That said, be ready for anything, anytime, anywhere. Bright side: Prevailing west winds off the Strait of Juan de Fuca mean a high chance of a tailwind!